Brunswick broke open a 4-4 tie against New Canaan on Saturday with an impressive 8-1 run in the second quarter, as the Bruins pulled away from the Rams at New Canaan, 19-9. The non-league win gives Brunswick, ranked ninth nationally, a 6-0 record on the year. In the second quarter the Bruins started their decisive run with three-straight goals, building a 7-4 lead by the 7:33 mark. AJ Delgado netted the first goal of the scoring burst with a swooping lefty dodge and goal. Brody Firestein and Michael Gottlieb followed with markers to finish the three-goal run. After the hosts countered with a solo tally at 7:10, the Bruins finished the second stanza with a five-goal run to take a commanding 12-5 lead heading into the break. Delgado added two more goals during the burst, while Cooper Moore netted one goal and helped on another. New Canaan opened the third frame with a goal on a two-man advantage to slice the deficit to 12-6. Brunswick netted the next two goals, as the teams each added two goals apiece to close-out the third quarter. Leading 16-8 in the fourth quarter, the Bruins scored three-straight goals, before New Canaan capped the scoring with a goal with 94 seconds left in the game. 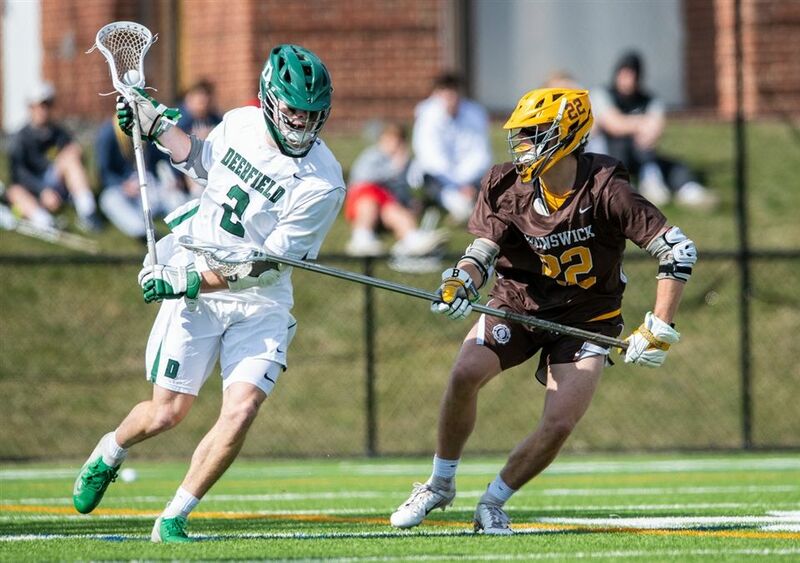 The 19 goals by Brunswick is a new season-high and matches the most goals scored by Bruins since netting 19 against New Canaan nearly a year ago (April 14, 2018). Brunswick returns to action with a non-league home game against Lawrenceville on Wednesday, April 17.